Sasaki’s photographs in the beginning of this book jolt one awake to what he means by minimalism. Some people are so radical that it makes the rest of us look like hoarders. But by the end of this very simply-written and superbly-argued short book, most of the arguments we have for cluttering our space and complicating our lives are defeated. One must recognize at some point that whatever dreams are mixed up in purchases we have made, the potential of the ideas quickly fade when not acted on immediately, as in when the objects are “saved” for something we vaguely anticipate in the future. In the minimalist outlook, objects should do some kind of worthwhile duty, even if that duty is to make us happy, or please our senses. When objects become a burden, or chastise us by their silent immobility, collecting dust, literally taking up the space we need to breathe, we can give them away, throw them out, auction them off, or otherwise get them out of our lives so that some potential can grow back into our ideas. That means even books we bought with the intention to read but which make us sad every time we look at them. But don’t take my word for it. Sasaki really does have an answer for every possible objection you may have. For instance, #37. Discarding memorabilia is not the same as discarding memories. Sasaki quotes Tatsuya Nakazaki: “Even if we were to throw away photos and records that are filled with memorable moments, the past continues to exist in our memories…All the important memories that we have inside us will naturally remain.” I am not convinced this is so at every stage of life, but think there is a natural life to what we need in terms of archival items. If your children don’t want it, you don’t need to keep all of it. Keep the ones that matter only. Note that Sasaki recommends scanning documents like old letters that are important to you because you can’t go out and buy another if you find you were too radical in your culling. However, even the archival record becomes a burden when it becomes too large unless well-marked with dates, etc. He admits that letting go of those stored memories is a further step in true minimalist living. The freedom one experiences when one owns fewer things is undeniable. Sasaki expresses the joy he experiences when he visits a hotel or a friend who uses big bath towels. He’d limited himself to a microfiber quick-drying hand towel for all his household needs, and enjoyed the lack of big loads of washing at home and using big thick towels while he was out: a twofer of happiness. We are encouraged to find our own minimalism. Everyone has their own limits and definition. The author explains that #15. Minimalism is a method and a beginning. The concept is like a prologue and the act of minimizing is a story that each practitioner needs to create individually. We definitely don’t need all we have, and the things we own aren’t who we are. We are still us, underneath all the stuff. Some people will find this reassuring; others may find it disconcerting. 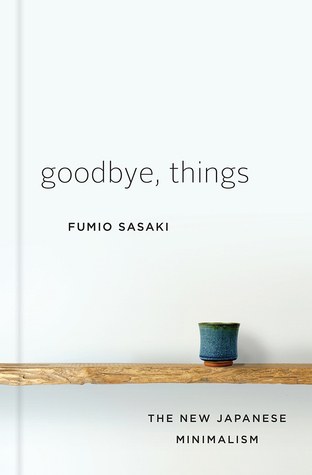 At the end of this small book, Sasaki reminds us the clarity that comes with minimalism. Concentration is easier. Waste is minimized. Social relationships are enhanced. You don’t need forty seconds in a disaster to decide what to take. You live in the now. The translation of this book is fantastic, by Eriko Sugita. It does not read like a translation, but as an intimate sharing by someone who has been through the hard work of paring down one’s possessions so that his own personality shines through. It is a kind of gift. Even if one doesn’t throw a thing away (I heartily doubt that will be the case) after (or during) the reading of this book, the notions are seeds. Gratitude grows in the absence of things.